Sorry to bang on about my ankle, BUT… really my whole life at the moment is all about my right leg. After 4 HOURS of surgery, my wonderful surgeon has basically replaced the hardware from Spain with the Best of British. The fibula had to be lengthened, the tibia stuck back together and the talus had to be straightened. 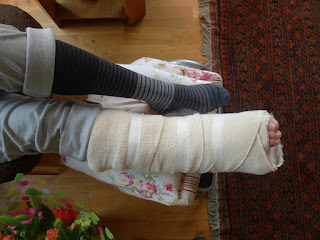 I am now sporting the world’s largest and heaviest plaster cast, designed I think to stop me leaping about too much and therefore am housebound. The weather is still crap so doesn’t matter too much and I’m working my way through Kath’s extensive library. Now that's what you call a cast!! Lawrence is of course waiting on me, he doesn’t have much choice, poor boy. I’m sure there will be pay back to come. We are hoping the Allianz will come to the party re payment for the surgery, as my specialist nearly had a fit when I told him that they proposed to fly my home to Australia for the corrective surgery (“putting your life at risk!”), so we now have clout on our side and some weapons in the background such as the Australian Medical Board, and of course solicitors if necessary for a negligence case. Small but tasteful presents are always appreciated, although not necessary. Thanks Sandie for the flowers!!! What’s That Golden Orb in the Sky? ?